Earn $8.72 in VIP credit (872 points)What's This? Designed for the elite racers, the Assos Rain Bootie is designed to face bad weather and rise to the occasion. Ultra lightweight, these waterproof shoe covers feature an ingenious zip-free design that has been fine-tuned for the UCI WorldTour, locking out wind and water without compromising on weight, breathability, or performance. Featuring an innovative internal membrane, the Rain Bootie prevents any water from entering your riding shoe thanks to Assos' carefully engineered mix of fabrics. 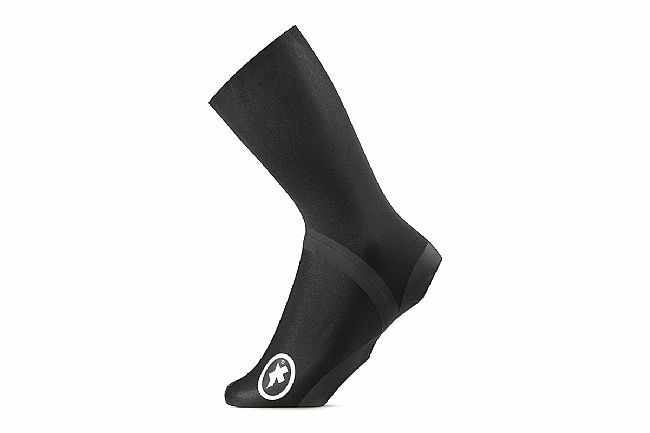 When combined with Assos' EVA KANT waterproof fabric, this allows the bootie to create a seal around your foot. The taped raw-cut edges around the cleat hole and heel, raw-cut ankle edges and its zip-free design all contribute to its premium quality and keep the volume to a minimum. The result is a high performance piece of equipment that’s fit for pros and amateurs alike, so you will be ready when the storm hits.